The genus Agave has about 200 species naturally distributed in the Neotropics. Agave is a genus with a long tradition of uses, mainly alimentary, medicinal and industrial. Agave: Characterization, Analysis and Uses opens with a summary of the introduction of the genus Agave in the Iberian Peninsula, while also providing some insight into its spread. Some species of Agave are important for obtaining steroidal hormones, which are synthesized from saponins present in the plant. 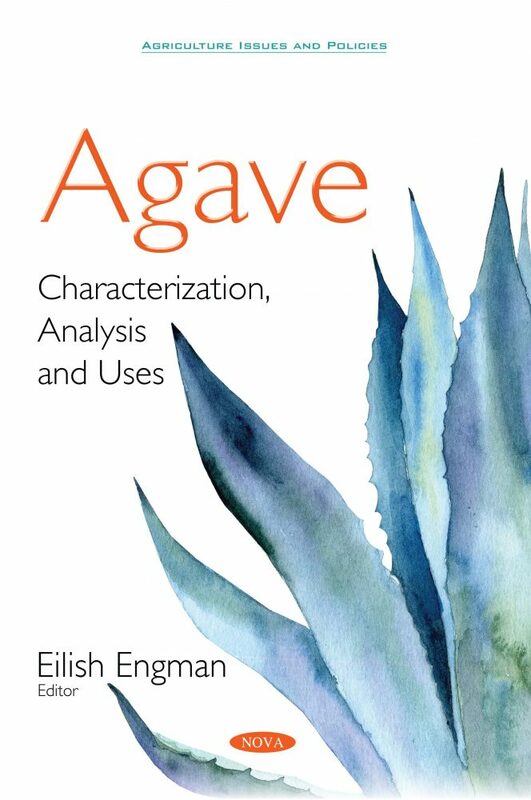 As such, the objective of the following chapter is to analyze the multiple ways of using species of the Agave genus in Mexico, taking into consideration aspects such as their metabolisms, development environments, artisanal and industrial processes, regulations, research and marketing. The previously mentioned saponins are naturally occurring compounds that are widely distributed in plant materials. They are found in many different plant families including the Agavaceae family. The authors discuss their applications in the pharmaceutical industry, particularly in the treatment of diseases such as cancer, diabetics, and hypertension among others. The authors also discuss how Agaves may be used to produce alcoholic beverages. The variety of Agave species, geoclimatic conditions and the production process has resulted in an important variety of beverages with specific aromatic and sensory characteristics, including Tequila and Mezcal.